Last Saturday’s Cybersalt news made mention of big things going on at Cybersalt Central… well, let me fill you in. About a month ago, my sister asked Tim to post an ad on the web for a Kawai piano she was trying to sell. I did a little research on-line regarding manufacture date, color name, etc. 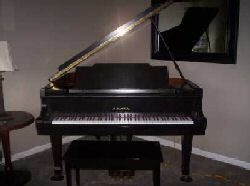 of said piano, and checked out prices of similar instruments that were for sale in our area. one of those impossible dreams since they are expensive instruments and like just about every other family I know, there are many other places for our money to go. A grand piano would have to come after so many other priorities – well, let’s just say, if it ever happened, I’d probably be in my 70’s or 80’s. But, since it’s a dream, I look every now and then, no strings attached, just see what’s there and what I’m shooting for in terms of cost. I already own a really good quality piano that my parents bought for me when I was working on my grade 9 exam, waaaay back in 1980. Really, a grand piano is just an excessive dream…. I sent that first e-mail on July 13; a week went by with no reply. No problem. It’s just a dream and there was probably something either misrepresented in the ad or hassle ahead. Truly, I am a master at keeping my heart in check and it was no disappointment to have no reply. I’m already swimming in the blessings of life, remember? OK, so at this point there is a little excitement. I’ve never actually made an appointment to go look at a piano… But Wednesday we have house guests arriving so perhaps Thursday or Friday? We make plans for Friday evening. Excitement is starting to grow – Wednesday evening I was telling a friend whose son takes lessons with me (who just got 86% on his grade 3 exam!) and all the possibilities for teaching began to grow too. If the piano was as good as it looked in the ad, I could get it. Have I mentioned that excitement was beginning to grow? Tim and I went together because I really needed his objective and steady presence as my heart was finding it harder and harder to stay grounded. The first glimpse showed the piano in direct sunlight – it was clearly brown. OK. That’s not what I was expecting, but was it critically important to me? Hmmm… I sat down to play it. Definitely out of tune but it had a very similar touch to my Petrof which I love. I played quietly at first – somewhere I had read that any instrument can sound big and loud, but it’s in the quiet sounds that its quality and true potential can be assessed. It sounded lovely. Driving home I asked Tim, “What do you think?” Without hesitation he replied, “You should buy it.” The excitement meter was poised and ready to launch to unknown of heights. ‘I should buy it.’ Really?? It was dark, dark, dark brown; I think I could live with that. It was smaller than what had been in my mind as a good size for a grand. It seemed 5’8” would be a good size; this one was 5’, but maybe that was a better size for my house. I always thought I would like a Yamaha one day; this was a Kawai. I don’t know; are they comparable in quality? This was a lot of money to spend – is it the right thing to do, Father? I went back to the living room and it felt as though my Heavenly Father was very simply offering a gift. Would I like it? I was completely free to say yes or no. I checked the comparison of quality between Kawai and Yamaha on-line. Basically, Yamaha is known for having a lighter touch and brighter sound; Kawai is known for a firmer touch and more mellow sound. That’s what I prefer anyway!! 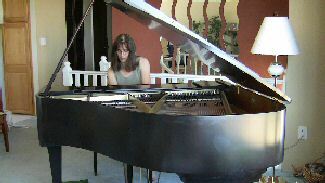 I called Mary Lou and said, “I’d like to buy your piano.” Unbelievable for me. It’s still unbelievable, except that it’s sitting in my living room right now!!!! So when Tim said there were big things going on, it was probably an understatement. There are huge things going on; there are impossible dreams coming true; there is unbelievable love being poured over a heart that is experiencing new expanses of being loved. It’s absolutely mind-boggling – I'll let you know when the giddiness subsides.